When I email you your reading you will receive a list of the cards drawn, my interpretation of their meanings as pertains to you and/or your question(s), and the meanings interpreted from the author's words. The one card draw gives a very basic answer to your question or potential issue. You will receive as much detail as I understand from the card drawn. The three card draw represents the past, present and future - but it could also represent present, issue/obstacle and outcome. The interpretation will depend on the question being asked and what the cards reveal. You will receive a detail description. 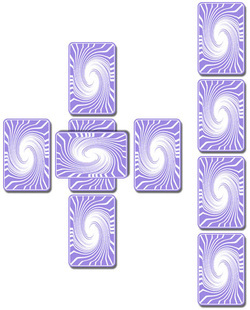 The nine card draw is a more elaborate and detailed reading, but similar to the three card draw. It will give past, present and future as well as influences, self and obstacles/outcomes. 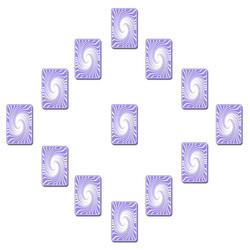 You will receive a detailed description of the order the cards were drawn and what each one represents and reveals. The Celtic Cross is probably one of my the most used and loved spreads used in both traditional Tarot readings as well as many Oracle divinations. The cross section of the spread represents you and the issues around you in the past, present and future. The staff section represents the influences and outcome. As with all the various layouts, you will receive a detailed account of the order of the cards, what the represent and what they reveal. This spread is great for knowing what your upcoming year may have in store for you. It is wonderful for birthdays or anniversaries or even the New Year. Each "spoke" on the wheel represents a month of the upcoming year with the center "hub" being your present month. Yes, some decks are larger than others. The full-deck spread cost varies depending upon the deck-size. 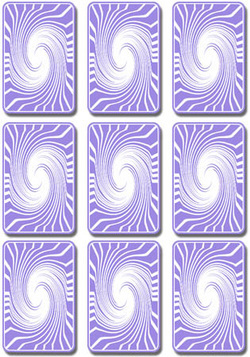 You will receive the order in which the cards revealed themselves along with the interpretations. I will draw them three cards at a time in order to better understand what they are trying to tell me. Photo banner © 2009 by Jean Carlos, all rights reserved. Other images © 2011 by Rob Carlos and used with permission.